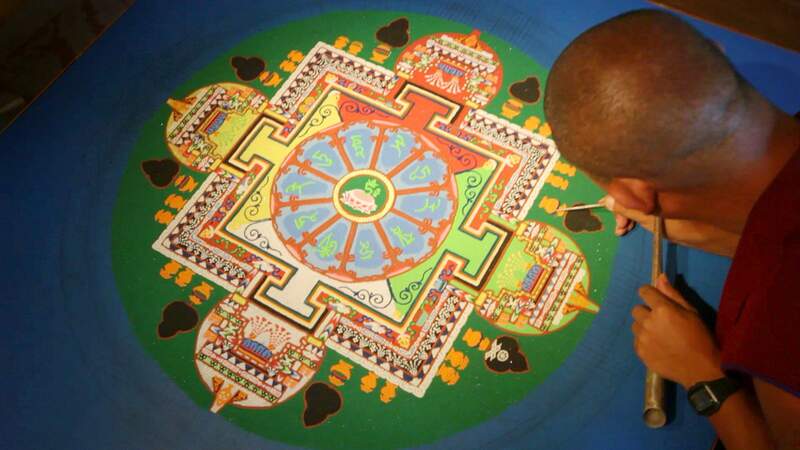 A Tibetan Monk from the Gaden Shartse Monastary, rubs a metal cone releasing sand used to create a Green Tara Mandala within the Open Shutter Gallery. In East Asia, Buddhists celebrate the Buddha’s death and entrance into final enlightenment in February. But at my local Zen temple in North Carolina, the Buddha’s enlightenment is commemorated during the holiday season of December, with a short talk for the children, a candlelight service and a potluck supper following the celebration. Early influencesBuddhism entered into the American cultural consciousness in the late 19th century. It was a time when romantic notions of exotic Oriental mysticism fueled the imaginations of American philosopher-poets, art connoisseurs, and early scholars of world religions. Continuity and changeTraditional Buddhism does in fact have many deities, doctrines and rituals, as well as sacred texts, ordained priests, ethics, sectarian developments and other elements that one would typically associate with any organized religion. But at the 1893 World Parliament, the Buddhist masters favorably presented their meditative tradition to modern America only as a practical philosophy, not a religion. This perception of Buddhism persists in America to this day. The Buddhists did not deliberately misrepresent their tradition or just tell the Americans what they wanted to hear. They were genuine in their attempt to make a 2,500-year-old tradition relevant to the late 19th century. Buddhism in AmericaOnce it was planted here though, Americans became particularly fascinated with the mystical appeal of Buddhist meditation. The lay Zen teacher Daisetsu Teitaro Suzuki, who was Japanese Zen Master Shaku Sōen’s student and translator at the World’s Parliament, influenced many leading artists and intellectuals in the postwar period. Thanks to his popular writings and to subsequent waves of Asian and American Buddhist teachers, Buddhism has impacted almost every aspect of American culture. The exotic appealBut American secular Buddhism has also produced some unintended consequences. Suzuki’s writings greatly influenced Jack Kerouac, the popular Beat Generation author of “On the Road” and “The Dharma Bums.” But Suzuki regarded Kerouac as a “monstrous imposter” because he sought only the freedom of Buddhist awakening without the discipline of practice. This article was originally published on The Conversation, an independent and nonprofit source of news, analysis and commentary from academic experts. Read the original article at http://bit.ly/2Gvj6se.